Benazir Bhutto was the daughter of Zulfikar Ali Bhutto, Pakistan’s first democratically elected prime minister. His political career was also brought to a premature end when he was hanged by the military regime of General Zia-ul Haq. Benazir went on to become prime minister twice in the 1990s, but she was always distrusted by the military, which used corruption allegations to remove her from power. At the time of her death she was making a bid for a third term as prime minister. The assassination caused widespread civil unrest in Pakistan. Bhutto’s supporters took to the streets, putting up road blocks, lighting fires and chanting anti-Pakistan slogans. A decade later, the general in charge of Pakistan at the time has suggested people in the establishment could have been involved in her murder. And, he said, those elements could have had a bearing on her death. It’s a startling statement from a former Pakistani head of state. Normally military leaders in Pakistan deny any suggestion of state complicity in violent jihadist attacks. Musharraf has himself been charged with murder, criminal conspiracy for murder and facilitation for murder in relation to the Bhutto case. Prosecutors say that he phoned Benazir Bhutto in Washington on 25 September, three weeks before she ended eight years in self-imposed exile. Long-serving Bhutto aide Mark Seighal and journalist Ron Suskind both say they were with Bhutto when the call came in. According to Seighal, immediately after the call Bhutto said: “He threatened me. He told me not to come back. He warned me not to come back. 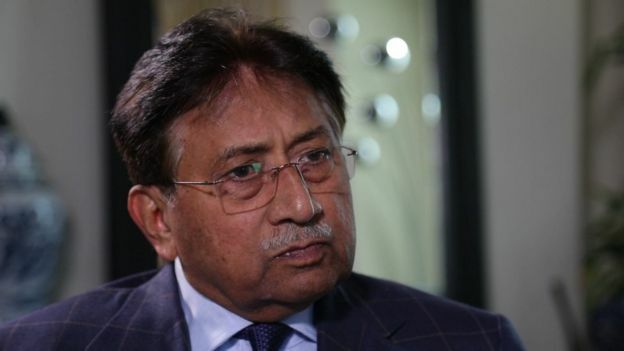 The legal proceedings against Musharraf have stalled because he is in self-imposed exile in Dubai. Benazir Bhutto’s son and political heir, Bilawal, has rejected his denials out of hand. While Musharraf’s case is on hold, others have been acquitted of the crime. Within weeks of the assassination, five suspects had confessed to helping the 15-year-old Bilal assassinate Bhutto at the behest of the Pakistani Taliban and al-Qaeda. The first person to be arrested, Aitzaz Shah, had been told by the Pakistan Taliban that he would be the suicide bomber chosen to kill Bhutto. Much to his annoyance he was kept in reserve in case the attempt failed. Two others, Rasheed Ahmed and Sher Zaman, confessed they were mid-ranking organisers of the conspiracy and two Rawalpindi-based cousins, Hasnain Gul and Rafaqat Hussain, told the authorities that they provided accommodation to Bilal the night before the killing. Media captionWho assassinated ex-Pakistan PM Benazir Bhutto? 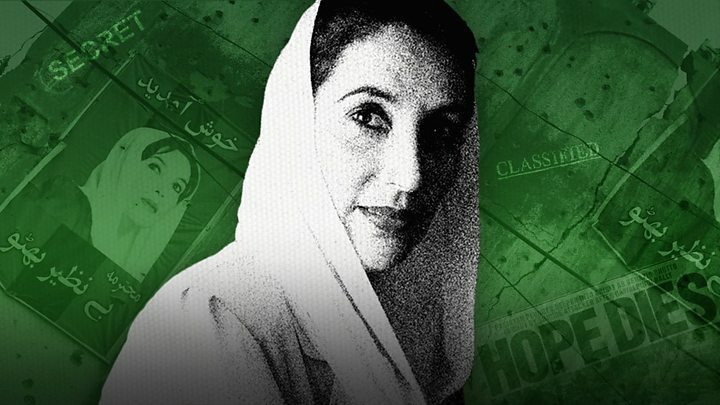 You can download Owen Bennett Jones’s 10-part podcast on the murder of Benazir Bhutto. It is called The Assassination. Even though these confessions were subsequently withdrawn, phone records showing the suspects’ locations and communications in the hours before Bhutto’s murder seem to corroborate them. Hasnain Gul also led the police to some physical evidence in his apartment. DNA from Bilal’s body parts gathered after his attack and tested in a US lab matched the DNA on some training shoes, cap and a shawl Bilal had left behind in Hasnain’s residence when he put on his suicide vest. Just a few months ago prosecutors were confident these alleged plotters would be convicted. But in September the case collapsed, with the judge declaring that procedural errors in the way the evidence was gathered and presented to the court meant he had to acquit them. 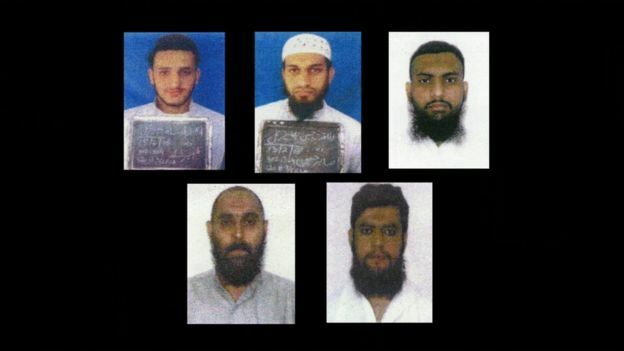 The five are still in detention pending an appeal. A dominant figure in Pakistani politics, Ms Bhutto served twice as the country’s prime minister, from 1988 to 1990 and from 1993 to 1996. Young and glamorous, she successfully portrayed herself as a refreshing contrast to the male-dominated political establishment. But after her second fall from power, she became associated in the eyes of some with corruption and bad governance. Ms Bhutto left Pakistan in 1999, but returned in October 2007 after then-President Musharraf granted her and others an amnesty from corruption charges. She was set to take part in an election called by Mr Musharraf for January 2008. But her homecoming procession in Karachi was bombed by suspected militants. She survived the attack, which killed well over 150 people, but would be assassinated two months later. In Pakistan it is commonplace to hear people accuse Benazir Bhutto’s widower Asif Zardari of having organised the assassination. The claim is normally based on the observation that since he became president after her death he was the one who benefited most. The conspiracy theorists, however, have not produced a single shred of evidence to indicate that Asif Zardari was in any way involved in his wife’s death. He has denied the allegation in the strongest possible terms. Those who make the allegation, he said, should “shut up”. Asif Zardari faces another accusation: that despite having the powers of the presidency, he failed to properly investigate his wife’s murder. Secret official documents relating to the investigation and obtained by the BBC show that the police inquiries were so poorly managed as to suggest they never wanted to find guilty parties beyond the low-level plotters they had already arrested. 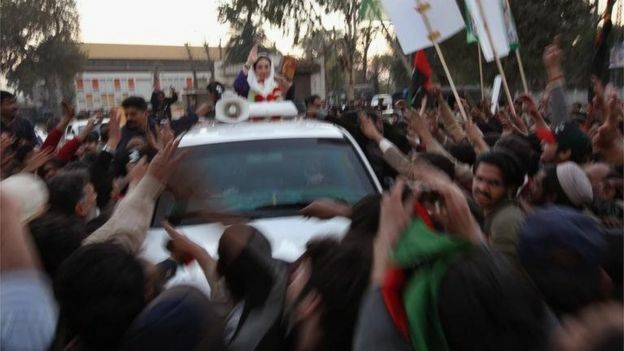 The inadequacies of the police investigations were especially apparent after an unsuccessful attempt on Bhutto’s life on 18 October 2007 – two and a half months before she was killed. Two suicide bombers attacked her convoy and killed more than 150 people. 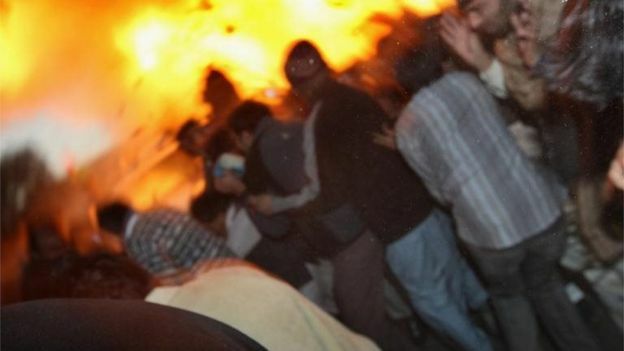 It remains one of the deadliest attacks ever mounted by violent jihadists in Pakistan. The police work was so half-hearted that the bombers were never even identified. The leader of the inquiry, Saud Mirza, has said that one man he established to have been a bomber had distinctive features, suggesting he came from a long-standing but small Karachi-based community of people of African descent. This potentially significant clue about the suspected bombers identity was never released to the public. Former President Zardari answers criticisms about the thoroughness of the police work by pointing out that he encouraged the work of Scotland Yard in relation to the murder and secured the appointment of a UN commission of inquiry to examine the circumstances of her death. That inquiry, however, says it was repeatedly and blatantly blocked not only by the military but also Zardari’s ministers. “There were many people in the establishment that we wanted to interview but they refused,” said Heraldo Munoz, the head of the UN commission. And he said some of the obstacles came from the politicians as well as the military. As the investigation progressed, he said, the safe house the UN team used was withdrawn, as were the anti-terrorist personnel who were protecting the UN staff. That there was a cover-up is beyond doubt. 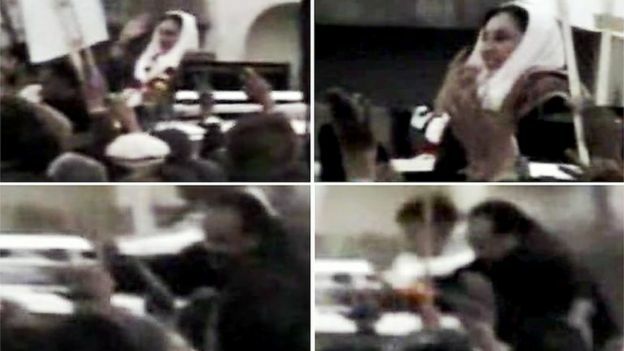 A BBC investigation found evidence suggesting that two men who helped the teenage assassin reach Benazir Bhutto were themselves shot at a military checkpoint on 15 January 2008. 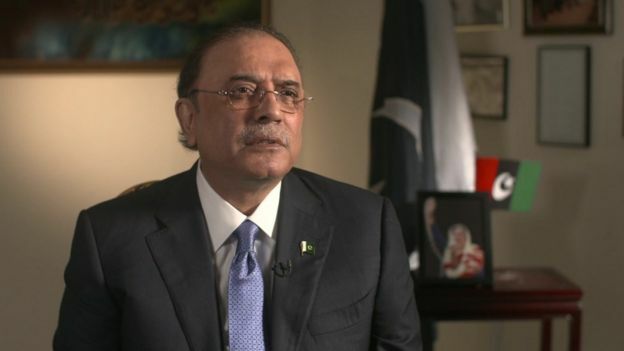 A senior member of the Zardari government has told the BBC that he believes this was “an encounter” – the term Pakistanis use for extra-judicial killings. Nadir and Nasrullah Khan were students at the Taliban-supporting Haqqania madrassa in north-west Pakistan. Other students associated with the seminary who were involved in the plot also died. One of the most detailed official documents obtained by the BBC is an official PowerPoint presentation given to the Sindh provincial assembly. It names Abad ur Rehman, a former student at the madrassa and bomb-maker who helped provide the suicide jacket used to kill Benazir Bhutto. He was killed in one of Pakistan’s remote tribal areas on 13 May 2010. Then there was Abdullah who, according to the Sindh assembly presentation, was involved in the transportation of the suicide vests ahead of the Rawalpindi attack that killed Bhutto. 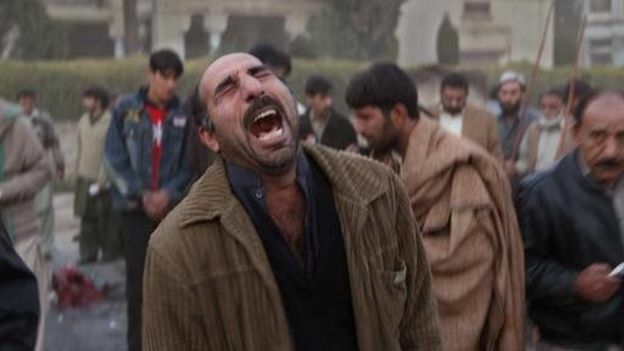 He was killed in Mohmand Agency in northern Pakistan in an explosion on 31 May 2008. One of the most high-profile deaths related to the assassination was that of Khalid Shahenshah, one of Bhutto’s security guards. Shahenshah was within a few feet of Bhutto as she made her final speech in Rawalpindi. Phone footage shows him making a series of strange movements for which no one has offered any reasonable explanation. Although he kept his head completely still, he raised his eyes towards Bhutto while simultaneously running his fingers across his throat. Pictures of his gestures went viral and on 22 July 2008 Shahenshah was shot dead outside his home in Karachi. 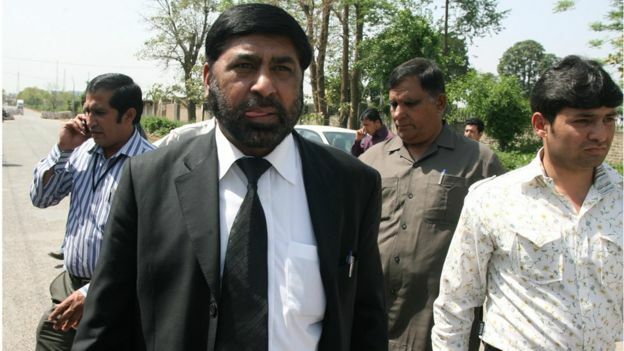 The next victim was the state prosecutor, Chaudhry Zulfikar. A lawyer with reputation for high degrees of both competence and doggedness, he told friends he was making real progress on the Bhutto investigation. On 3 May 2013 he was shot dead on the streets of Islamabad as he was being driven to a legal hearing on the case. Finally, there is a man who was said to be dead but, in fact, is still alive. In their confessions the alleged plotters said that on the day of the murder a second suicide bomber named Ikramullah accompanied Bilal. Once Bilal had succeeded in his task, Ikramullah’s services were not required and he walked away unharmed. For years Pakistani officials insisted that Ikramullah had been killed in a drone strike. In 2017 chief prosecutor Mohammad Azhar Chaudhry told the BBC evidence gathered by Pakistani investigating agencies, relatives and government officials established that “Ikramullah is dead”. In August 2017, however, the Pakistani authorities published a 28-page list of the country’s most wanted terrorists. Coming in at number nine was Ikramullah, a resident of South Waziristan and involved, the list said, in the suicide attack on Benazir Bhutto. The BBC understands that Ikramullah is now living in eastern Afghanistan where he has become a mid-ranking Pakistan Taliban commander. So far the only people punished in relation to the murder of Benazir Bhutto are two police officers who ordered the murder scene in Rawalpindi to be hosed down. Many Pakistanis regard those convictions as unfair, believing that the police would never have used the hoses without being told to do so by military. It suggests, once again, a cover-up by Pakistan’s deep state – the hidden network of retired and serving military personnel who take it upon themselves to protect what they consider Pakistan’s vital national interests.